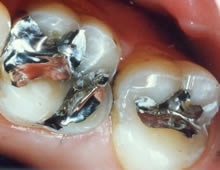 Fillings are the most common type of 'restorative treatment'. A filling replaces the part of the tooth that has been lost either because decay has caused a cavity in the tooth or because the tooth has broken. One option in restoring the tooth is to have an Amalgam filling however with high quality tooth colored fillings available, amalgam usage is now declining. They look unattractive in the tooth due to its color. The coloring leaches into the dentinal tubules inside the tooth, leaving a permanent blue-gray halo that bleaching cannot remove. A local anesthetic will be given to numb the tooth and the surrounding tissue. Depending on the size of the filling, a band may be placed around the tooth which helps to hold the filling material in place while it is being packed into the tooth.